Anoop Manoj Desai (born December 20, 1986) is an American singer-songwriter best known for his time as a contestant on the eighth season of American Idol. Motivated by the death of his friend Eve Carson, Desai auditioned for American Idol. Desai made American Idol history by being the first ever 13th finalist on American Idol. Favored to win by celebrities including Ellen DeGeneres and Keith Urban, Desai achieved a sixth-place finish, becoming the second Indian American to advance to the final stages of American Idol. Desai, an only child, was born in Cary, North Carolina. His family moved to Chapel Hill, North Carolina, in 1998. He went to Fuller GT Magnet Elementary School in Raleigh, North Carolina. His parents both work in North Carolina’s Research Triangle. Desai’s father, Manoj Desai, graduated from IIT Kanpur and came to the US in 1977, and his mother, Nalini Desai, studied in a college program in Navsari, Gujarat and earned her doctorate in South Africa, and works in the bio-tech field. He is fluent in Gujarati. In the 1990s, Desai appeared on the WRAL-TV (NC Triangle) television children's show, CentralXpress.com, and played the character "Raj". The show won multiple awards, including seven regional Emmys, two national Iris awards, and a national Gabriel Award. Desai attended Carnage Middle School and Phillips Middle School, then later went on to attend East Chapel Hill High School, graduating in 2004. During his time at East Chapel Hill High School, he was a member of the all-male a cappella group, the Chiefs of Staff. He was awarded a four-year academic merit scholarship to attend the University of North Carolina at Chapel Hill, and was the Haywood W. Hinkle Carolina scholar from 2004 to 2008. After being accepted and planning to attend college at the University of North Carolina at Chapel Hill, Desai auditioned for and was accepted as a member of the UNC Clef Hangers, a long-standing male a cappella group founded in 1977. He was accepted in the group as a senior in high school with the understanding that he would begin attending the University in the fall of 2004. Desai served as the group's music director during his junior year and as the group's president his senior year. 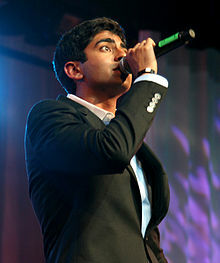 Desai’s performance as a soloist on the song “She Has No Time” was recognized with the BOCA 2007 (Best of College A Cappella). Desai graduated from UNC in 2008 with a bachelor of arts degree, with a double major of political science and American studies. He was awarded the 2008 Peter C. Baxter Memorial Prize in American Studies, as one who exemplified "intellectual excellence, personal warmth and creativity." Desai's first finals performance of Michael Jackson's "Beat It" was panned by the judges, with Simon Cowell saying that it was "very lightweight" and that he regretted choosing Desai for the Top 13. But Desai won the judges over again the next week, when he sang Willie Nelson's classic country ballad "Always On My Mind" for "Grand Ole Opry Week." Even Cowell was impressed, and retracted his remarks about Desai not deserving to be in the Top 13. Desai's rendition of Cyndi Lauper's "True Colors" three weeks later, which also garnered praise from the judges, prompted Cowell to compare the contestant to a "yo-yo", going back and forth between good and weak performances. ^Note 1 Desai was initially eliminated, as he did not receive enough votes to advance immediately to the Top 12. However, on the March 4 results show, the American Idol judges selected him as one of the 8 Wild Card contenders. ^Note 2 Desai was selected as one of the finalists. His selection marked the first time in the show's history that 13 finalists were chosen. ^Note 3 When Ryan Seacrest announced the results in the particular night, Desai was in the bottom three, but declared safe second when Megan Joy was eliminated. ^Note 4 When Ryan Seacrest announced the results in the particular night, Desai was in the bottom three, but declared safe second when Scott MacIntyre was eliminated. ^Note 5 Desai was saved first from elimination. ^Note 6 Due to the judges using their one save to save Matt Giraud, the Top 7 remained intact for another week, in which there was a double elimination. Since appearing on American Idol, Desai has appeared on The Ellen DeGeneres Show, Live with Regis and Kelly, The Mo'Nique Show, Access Hollywood, Today, and local radio stations across the nation. He has also performed with Amos Lee in Atlanta, Georgia. Desai also performed on the American Idols LIVE! Tour 2009 with his fellow Top 10 contestants; the tour visited 50 cities in the United States and Canada from July 5 to September 15, 2009. Desai's first single, titled "My Name," was co-written by Brandon Rogers and Desai, and was released on March 23, 2010. His debut album, titled All Is Fair, was produced by Ian Schreier and was released on May 4, 2010. Desai's second single, titled "All Is Fair (Crazy Love)," was co-written by David Mikush and Desai. Desai was selected by Clear Channel Music and iheartradio as an "artist to watch" for September 2010 with this single as the featured track. The music video for "All Is Fair (Crazy Love)" was released on February 3, 2011. Desai began performing in live concerts as a part of the All Is Fair Tour in Fall, 2010, with the first show in Carrboro, N.C., on October 8, 2010. In addition to the headlining shows, he often performs at charity appearances. Desai now resides in Atlanta, Georgia, and is currently working on a project entitled Zero: The Mixtape. The project is a collaboration with Atlanta-based musicians, writers and producers including DJ Trauma. The mixtape will be released in multiple parts, and the first installment was to become available on March 23, 2011. The second EP is expected to release in July, and the third EP is expected to release in October. He is being represented and managed by The Industry Connect. Desai now performs hip-hop and soul music under the name TOTEM. ^ "It's Dim All the Lights for Anoop Desai: Rediff.com Movies". Movies.rediff.com. 2009-04-23. Retrieved 2010-01-10. ^ "Lil Rounds and Anoop Desai - Anoop desai". American Idol. Retrieved 2010-01-10. ^ "W.H.Fuller Elementary Gifted and Talented Magnet School, Raleigh, NC". Fulleres.wcpss.net. Retrieved 2010-01-10. ^ a b Pais, Arthur J (March 19, 2009). "Anoop Desai in American Idol top 10". Rediff.com. ^ "The UNC Clef Hangers :: Carolina's Oldest A Cappella Group". Clefhangers.com. Retrieved 2010-01-10. ^ "Anoop Desai preparing debut set". USA Today. January 22, 2010. ^ "Anoop Desai unveils Zero The Trilogy". Asia Pacific Arts. 2011-03-23. ^ Parker, Lyndsey (June 29, 2016). "The Artists Formerly Known As Idols: New Names, Same Talent". Yahoo! Music. Retrieved March 4, 2019. ^ "'Idol' boosts Connick, Sinatra sales". USA Today. May 12, 2010. This page was last edited on 5 March 2019, at 13:35 (UTC).